Is this a Norwegian Forest cat? 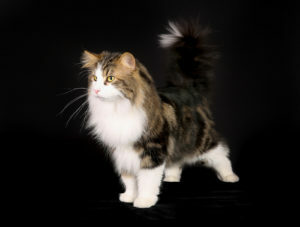 Please would experienced breeders/keepers of Norwegian Forest cats advise me whether you believe this cat is of this breed? Ann Carrington: Thank you Denise Nolen-Rice for your comments. Please would you advise me what makes you believe this? Ann Carrington: Very nice, male or female? What do you see in your beautiful cat that you see missing in mine? I dont have a problem with total honesty, say what you see by all means. Ann Carrington: Denise Nolen-Rice Im sorry Im not quite following what you mean? Ive no problem with what you’re saying, none what so ever. Im just trying to be clear with what you’re telling me. I thank you very much for your honesty and appreciate your comments. Ann Carrington: Thank you for pointing out the differences thats the sort of information I’d appreciate or if you believe she is NFC please advise me in what way. I do very much appreciate your honesty good or bad. Denise Nolen-Rice: See how fluffy mine is ? Denise Nolen-Rice: You need to wait for someone else to advise you. Nancy Graham: I’m not a breeder, but I love my purebred NFC. This is definitely not a purebred NFC. Where did you get your cat, which is very pretty and has a lovely, fluffy tail? And, why are you so concerned about it’s breed, if any? Ann Carrington: Thank you all very much for your comments as I said I’m very appreciative of your time in helping me make comparisons. I’m very sorry for not being totally upfront with my reasons for asking but I did not want to influence your judgement in any way. It’s a very long story but the upshot was I had to PTS a very much loved British Blue. I loved his character very much and having become aware if the NFC via a friend taking on a kitten I read up on the breed and having a busy household with two dogs this breed I thought was a good addition. However though advertised as NFC and being long haired she clearly isn’t. She was in a bad situation and in my opinion in danger from 4 bull dogs in a 3rd floor single bedroom single reception room broom cupboard for a kitchen flat which housed 2 home bred puppy bull dogs. Parents to aggressive to allowed to meet visitors and still grieving for my other cat I believed she was as claimed for a very short time. Though I did pay the full asking price I paid more than a Domestic long haired cat was worth. 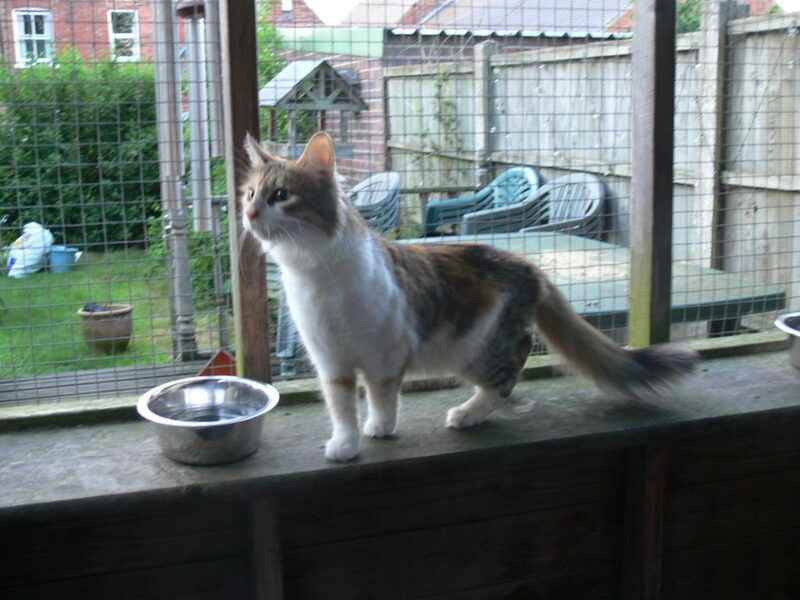 I have contacted the seller a number of times to advise cat struggling in our home & offered to return her. The seller has chosen not to reply other than to suggest I was threatening her. I an now planning on going to small claims court to get refund and I need as much body if evidence to support my claim as I can get. The seller claimed she gad bought the cat ad a kitten without pedigree papers to reduce price. Whilst I didn’t nerd her to be a perfect show example if the breed I bought believing the car was NFC and as such her character would be relaxed with other animals in the home. That isn’t the case. Whilst she is beginning to progress with even socialising with my other two cats there is still a long way to go. I have gad her since May28th and find her a very nervous cat who will happily hide away under a sofa even now only coming out for food. Denise Nolen-Rice: How long have you had her ? Ann Carrington: 3 weeks on Sunday. I had her spayed last week.and just about to come into season. Mana Bell: Looks like a ragdoll mix to me. Denise Nolen-Rice: Eileen MacGillivray do you think my Tinkerbell is all NFC? Ann Carrington: Yes Ive made a commitment to keep her. Thats why shes spayed now and chipped. There is significant progress being made. When she first came she went out on the attack as though the bull dogs had trained her. Now she’ll share the same space [so long as there’s some distance between them] with my other two. Kristen Davidson: Somewhere there is a guide based upon the facial profile. Also, paws of an NFC have fur tufts between the toes. I wonder if there is DNA testing for this?